Faith Fix, ASID, of Freestyle Interiors, describes it as a range of influences that reference the organic colors and textures of coastal nature, and signature styles associated with different coastal areas around the world. “The Florida ‘coastal style’ is an amalgam of influences from different cultures and people coming from different areas, so in some places you might see a lot of Mediterranean influence, and in others, a more ‘traditional New England’ sense of style. For homeowners who want to bring coastal-style influences into existing décor, lighting, accessories, artwork, paint, and texture can turn a home into a coastal retreat. Ms. Fix referenced the interior décor in the three models at Mangrove Bay as examples. With the Keewaydin II, the interior design choices were “contemporary coastal,” with a palette of platinum, stainless, chrome, and creamy tones with pops of color. Coastal style has never been more elegantly refined than at Mangrove Bay. There are 20 different one- and two-story floor plan designs offered – as well as four soon-to-unveil three-story Cove Residences with unique built-in boat garages. This is the perfect time to consider a dwelling with these unmatched views. The Amelia III Waterfront Residence model, temporarily the Mangrove Bay Sales Center, is a four-bedroom plus den, four-and-½ bath home with all primary living spaces (including the master suite, two guest suites, and a private den) located on the ground level and a private-entry cottage features a generous sitting room, scaled-to-fit kitchenette, private bedroom and bath area, and private balcony. At approximately 3,640 SF under air, The Amelia III offers intricate trim details, a grand beamed, tongue-and-groove ceiling in the great room, cottage-style barn doors, and built-in upholstered bench seats which flank the whitewashed brick fireplace. A second fireplace creates a cozy intimacy in the outdoor living area. This gorgeous model home is available for purchase. 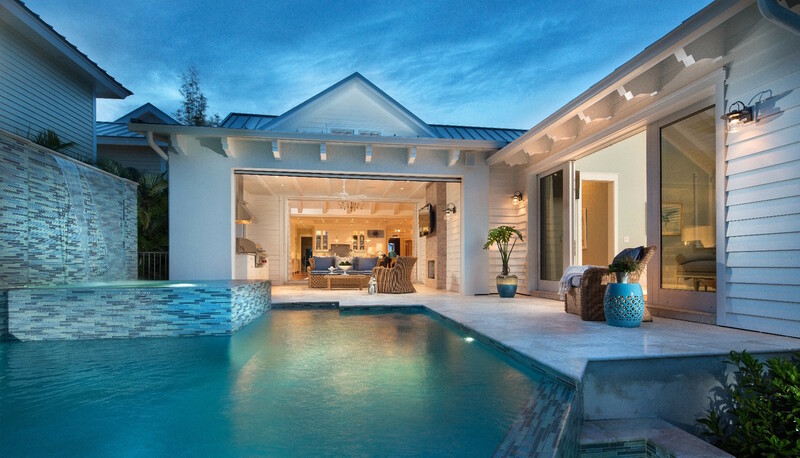 The two-story Sanibel III Courtyard Residence offers a four-bedroom, four-and- ½ bath design with approximately 3,331 SF under air, including a private-entry guest cottage with its own spacious deck above the rear-entry garage. The “respite reclaimed” beach-themed aesthetic of the Sanibel III offers dark, light, and weathered wood appointments that perfectly complement its limed oak wood floors, reclaimed wood accents, tongue-and-groove ceiling detail, barn doors, two-story cupola, French doors, transom windows, and custom moldings and cabinetry. Its ground-floor master suite includes corner-pocketing sliding doors, which open to the lanai surrounded by tropical landscaping, a soaring 1 ½-story covered outdoor living area with fireplace, and a pool and spa with a gently flowing water feature. This spacious model is also available for sale. 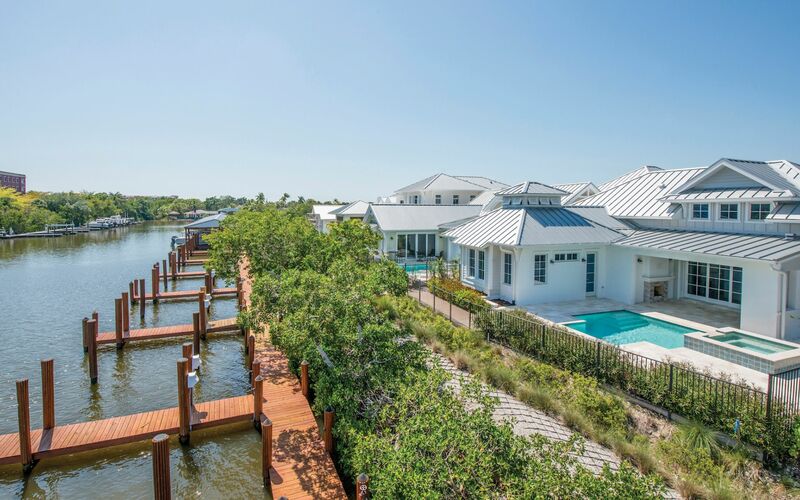 The Keewaydin II Waterfront Residence – which is already pre-sold with leaseback – has a total of four bedrooms and four-and- ½ baths, a second-floor loft area, and a private-entry guest house above the garage, offering over 3,700 SF under air. Its soaring two-story great room with a unique nickel gap wood ceiling has a focal point stone fireplace balanced by a stained entertainment built-in bar at the opposite end of the space. The kitchen’s exposed stainless steel hood boasts a quartz backsplash, the same quartz used in its island countertop. The Keewaydin’s ground-floor master suite offers an oversized sitting area with corner-pocket sliding doors overlooking the lanai, outdoor living space, pool, spa, and Gordon River. The master bath has a free-standing tub, oversized shower, and a separate makeup vanity and morning kitchen. 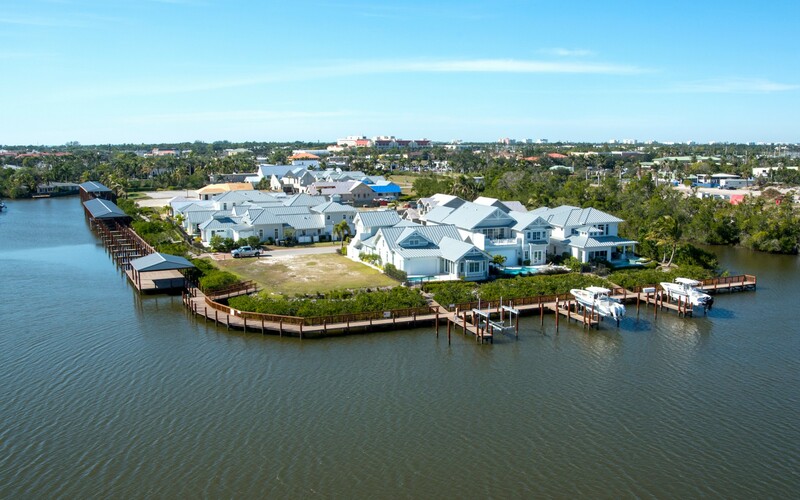 the benefit of resort-style living with an on-site Concierge Center, an owners-only boat ramp, and – of course — their own private boat slip. Complete pool care, landscaping, and dock maintenance are just a few of the services offered. Touring the model residences is the best way to experience Mangrove Bay and the extensive thought that went into their conception and interior design. 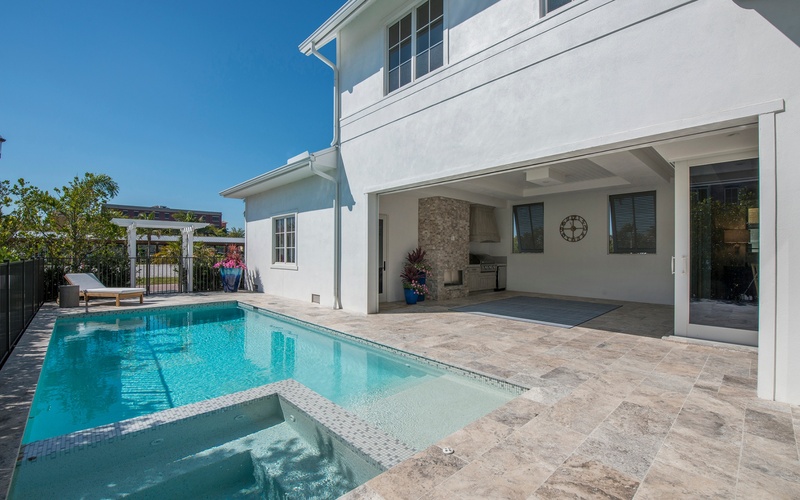 Theey are designed by MHK Architecture & Planning, built by Lotus Construction, LLC, and exclusively marketed by Paradise Realty of Naples, LLC. 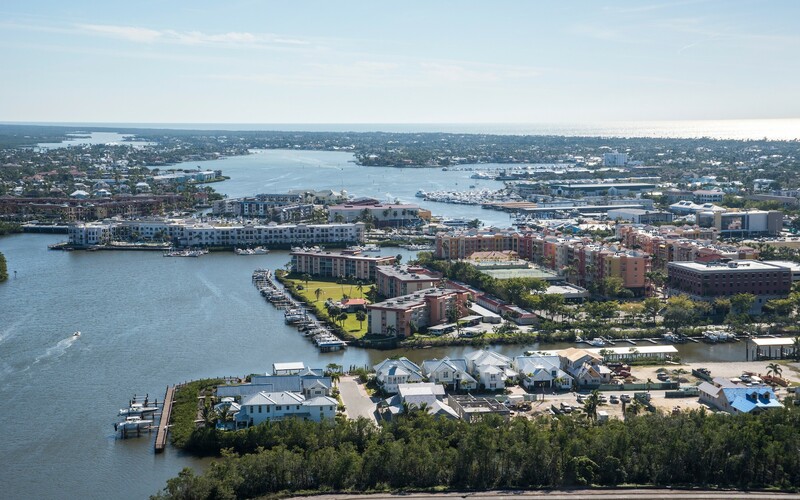 Learn more about Mangrove Bay by contacting the Sales Center (239.261.2200) and arranging a site tour or further exploring this website!